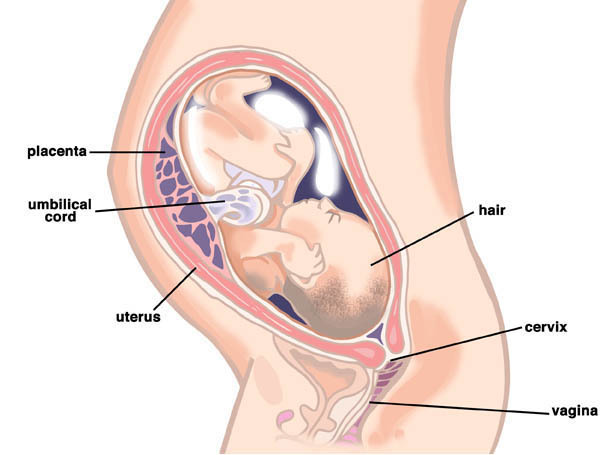 By this week the baby probably weighs about 1.8kg and measures around 48cm in length. Now that the baby has a lot more body fat, his or her skin no longer appears translucent; it is now opaque like that of an adult. The bones in the skull of the baby are still quite soft and are not yet fully joined. This enables the skull to be safely compressed a little during labour and delivery. As a newborn baby, he or she will have a number of small 'soft spots' on their head which will close in time. The largest of these will be on the top of the head towards the front, it is known as the anterior fontanelle and measures 4-5cm across. This will be the last of the soft spots to close. This usually occurs around 15-18 months. The baby will still be busy practicing all those essential survival skills such as breathing and swallowing. If your baby was to be born now, they would have a good chance of survival, but they would still need assistance with breathing and feeding, and it would be many weeks before you were able to take them home from the hospital. You may find that as your due date approaches, you are plagued by vivid and sometimes strange, or even scary, dreams. Of course, there are many theories out there about the power of dreams in terms of giving you information about the future. However, most psychologists believe that dreams occur as a result of your thoughts and worries, particularly the subconscious worries that you may not have acknowledged yourself. Any woman who is pregnant, especially for the first time, will be experiencing a range of emotions from excitement, to anxiety, sadness, fear or jubilation. In fact experiencing all of these at once is very common! Your dreams are a way of sorting through these feelings, although the resulting dreams can seem utterly bonkers at times! As you might expect, hormones also have to take some of the blame; they are thought to contribute to making the dreams so vivid. Common scenarios that pregnant women dream about include ones where you lose or forget something (like the baby) which reflect your worries about being a competent mother, and dreams about becoming physically unattractive or suddenly becoming obese. These often indicate worries about permanently losing your looks or your partner no longer finding you attractive. Remember that all these concerns are perfectly normal. Nobody starts parenthood as an expert; everybody has to learn as they go along, and you will too. With all this brain development taking place inside you, it is more important than ever that you ensure that you are getting the recommended dose of Omega-3 from your diet (as well as supplements if you are taking them). The best source of Omega-3 is oily fish, such as salmon, mackerel and sardines. Alternative sources of Omega-3 include plant oils such as flaxseed, rapeseed and soya. Nuts and seeds (particularly walnuts and pumpkin seeds) are good, as are dark green leafy vegetables such as spinach and broccoli. You can also buy products fortified with Omega-3, such as milk, bread and eggs. If you are taking a daily pregnancy supplement you may find that it contains Omega-3; this is good but remember that supplements should not be considered a direct replacement for nutrients gained from food. You should still aim to be consuming these foods in addition to taking your supplement. Page generated in 1.3195 seconds.